For a Rye resident now looking to recycle an old toaster or kettle they must undertake a 26 mile round trip to the ESCC recycling facility in Mountfield or travel a similar distance to New Romney recycling facility, which is run by Kent County Council. Aside from the insurmountable issue if you don’t drive, and hence can’t recycle your electrical waste by car, it also raises questions on the environmental impact of additional car journeys just to dispose of an old iron or hair dryer. 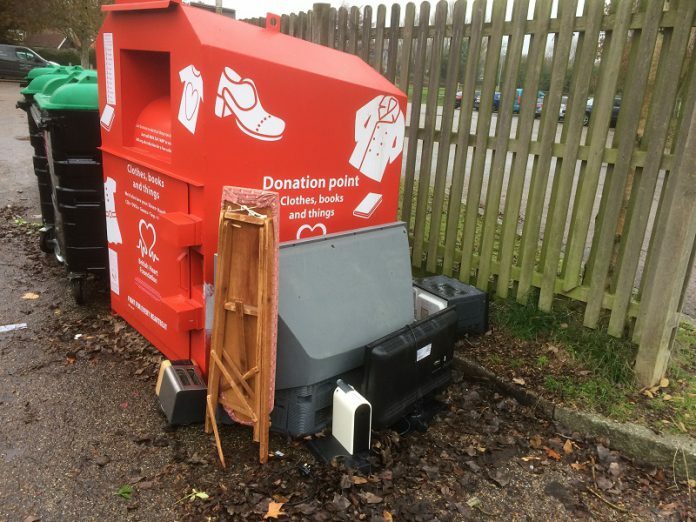 Small electrical recycling banks have also been permanently removed from other locations across RDC including Market car park in Battle and Fullers car park in Northiam and so the bigger question is how committed is RDC to providing local recycling facilities? Why RDC couldn’t just install a larger recycling bin is anyone’s guess but as you can see from the photo above, the fly tipping is already building up in Gibbet Marsh. Well they are obviously not committed at all, they could as you say have provided a larger bin, it is quite ridiculous and harmful to the environment that we have to travel so far to dispose of these things. Also I would like to ask the question why it is that we are asked to have separate boxes/containers for each household to dispose of glass old batteries etc when all the bin men do is through them in the lorry with the recycling anyway, seems odd to me or am I missing something. What do you expect RDC to do when they need to make savings. Having squandered £114,000 of rate payers money pursuing a nebulous 4000 mt tonnes fly tipping claim, taking it to the crown court only for to be dropped at the last minute. I watched the Kier contractor for RDC remove all the over spilling items from the all to infrequently emptied bins. He put it in his truck and I asked him what would happen to it. ‘it all goes to landfill anyway’ he said. RDC are a complete joke when it comes to recycling….and pretty much everything else! Useless. I was rather shocked to read this article that the electrical recycling bin had been removed. I have used it twice this year for a neighbour and my self. And as mentioned not at all environmentally or economically worth driving to the civic dumps to dispose of one Iron , or kettle for example. And not every one has space to store recyclable things until they have a car load. Can the town council not make a request for a bin to be put back. And also couldn’t we have a bin for used light bulbs ? So what do we do with old electrical items then if we are unable to get to the “recycling point” at Mountfield (or Kent’s far more friendly operation at New Romney)? Simply put any old small appliances in the black dustbin? Doesn’t seem right, but the problem is that if the council don’t provide this service then many will have little or no choice it would appear.